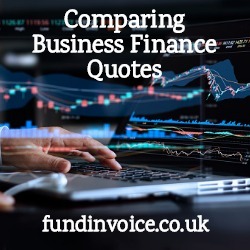 We had an enquiry from a prospective client who was looking for invoice finance quotes and, as is sometimes the case, they told us they hadn't been speaking to anyone else. However, once we started searching the market for them, it became apparent that they had used at least 2 other brokers already - each of whom would have contacted numerous funders. One of our funding partners had received the same lead into 2 of their geographically separate offices, from two other invoice finance brokers! This is something that we see occassionaly, it seems like some clients feel that they are going to get a worse quote if they tell us about what they have received already. That is not the case. If a customer says to us that a receivables finance company have quoted a given fee, we will seek to beat that fee. We will seek to beat it by a desired margin, or percentage, if the client wishes. The complication from using several brokers, beyond the repeated introduction of the same prospect to the same funders over, and over again, is that the client can be inundated with numerous quotes, making the decision making harder. It is difficult enough to compare quotes at the best of times, but the process can be daunting if you are dealing with numerous providers, and you don't understand the nuances of how they construct their prices. If you are using a broker who has access to the UK market, you only really need that one broker, and its best to go via the broker for your quotes - often, as in our case, they may have access to special deals and rates that may not be available if you contact the provider direct. Of course, there are brokers and other third party introducers - such as some accountants, that only deal with a small number of providers. Therefore, if you choose the wrong intermediary you could limit your choices. Our approach is to have undertaken the market research regarding both pricing, and service quality, so that we can give the best guidance to our clients. So, how many invoice finance quotes do you really need? Some people will say just the one, the best pricing or perhaps the only party that is prepared to fund a difficult situation. Generally, clients seem to want to compare the best 3 quotes. We are driven by what our client wants, assuming that there are enough parties willing to quote! Related article: "How Many Factoring Quotes Should You Get?"